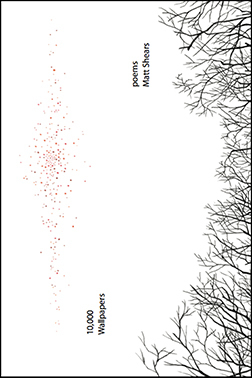 Matt Shears’ chapbook of poems, 10,000 Wallpapers, is a phenomenal genre-hopping hybrid work. It’s fun, experimental, mythic, mealy-mouthed and unprotected. Sonically, it’s flabbergasting, but never flabby. Thematically it’s indefinable but refined, self-reflexive and aware but awkward as a first kiss, or a first kill. It operates almost as a misheard fable traveling from ice age to Ave C, a place where Masque meets Western, where the Renaissance slips into its finest Greek to watch a dreamy commedia dell’arte production. It’s a place where heroes come unhinged, their singing severed from our fullest judgment by lost or destroyed pages, or who perhaps are being unsung themselves by a culture separating itself at its seams. In the end it’s a joyride. Or an open letter to a mastodon from an endangered element. Or each of us, emptied on an open page like some beautiful thing. This is very unusual collection of poems, a formidable departure from the nation’s workshops. The rhythms and cadences of these Alter(n)ations imitate and celebrate the life forms that inhabit our lives. I take Matt Shears’ work seriously and with respect. Matt Shears invents new worlds in 10,000 Wallpapers. This long lyric is full of brute terror and bucolic beauty, exploring individual consciousness unmoored by our present “thundering interconnectivity”; 10,000 Wallpapers chronicles “the everyman meandering through this digitized countryside,” questioning how we can truly inhabit the world when reality has become denatured by the image. The speaker in this poem sings like Prufrock, in a lyric that is searing and true, as he searches for the possibilities of pure utterance and perception amidst what is manufactured. Amidst a rural landscape bombarded with technology and the aftermath of history (both real and imagined), Shears creates poems of wonder and wandering, poems of longing and regret. Tidbits of mythology collide with folksongs and lullabies to create a fantastic place where “the Poem arises beauteous” yet “false projects glitter in the wind.” In these poems, bits and pieces of broken things do not add up to or equal their whole. Shears’ range of voice and unpredictable grace provide an exquisite backbone to the time/place/space that encompasses this vibrant collection. mchtnchts : The Spoiled West and its Freshly Minted Infants :: Already Dead (2014) – Analog electronic music used from text of 10,000 Wallpapers by Kyle Bruckman & Lance Grabmiller. codes assembling their brains from spectacular stimuli? May the waters ever shapeshift.